The Russian Top League has finished in Yekaterinburg. Earlier the tournament gave the participants a chance to qualify for the Superfinal, but this year the RCF found a way of motivating players to fight not only for the first five places, but for the clear first as well: according to regulations the winner is granted a place in the next Tal Memorial. 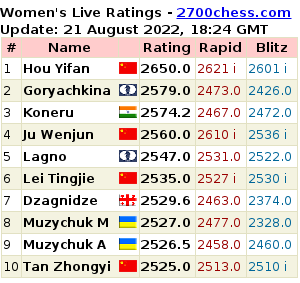 In a tough fight for the wished place mostly dominated less known players like IM Goganov and GM Shomoev, while better known players remained in the background; eventually only one of the well known 2700+ GMs Ian Nepomniachtchi managed to progress in the final stage of the competition finishing with the same number of points as Inarkiev (6.5 points). Nonetheless, Inarkiev had a better Buchholz tiebreak. 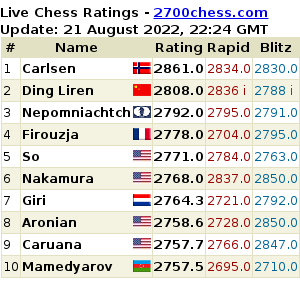 Ernesto Inarkiev is a grandmaster born in Kyrgyzstan in 1985. In early 2000s he took Russian citizenship and moved to Elista accepting Kirsan Ilyumzhinov's offer, soon after he moved to the capital. He's progress is dated back at mid-2000s when he won the Top League in 2006 and became the Bronze medalist at the Russian Superfinal. He was considered as one of the most promising Russian players and he was even invited to the national team. Nevertheless, later Ernesto remained in the shadow without achieving any outstanding results. He gained his decisive win in this tournament against Evgeny Tomashevsky in Round 8. Check out this and other games of the winner below. The key game of Round 9 of the Russian Championship Superfinal finished quite unexpectedly. Kramnik was fighting for a win against Nepomniachtchi as only this result would give him a chance to compete for a title. In a time trouble Vladimir not just failed to find a way to convert his considerable advantage, but also blundered and eventually resigned. Earlier Peter Svidler drew Sergey Karjakin confidently. First result of the Russian Championship Superfinal: Kramnik defeated Shomoev. The elite group of the Capablanca Memorial has completed the last round in Havana today. Before the last playing day Zoltan Almasi was half a point ahead of Yuniesky Quesada and Leinier Dominguez. The Cuban players faced each other in the last round and agreed on a draw in 11 moves. Soon Almasi also finished his game against Andreikin in a draw making only 22 moves.